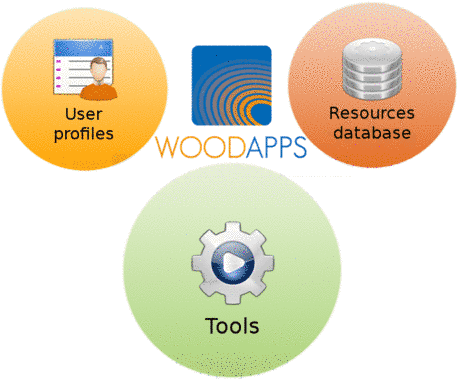 WoodApps is a research project funded by the WoodWisdom-Net Research Programme and the ERA-NET Bioenergy. The project aim is to develop a pilot "Information and Communication Service Platform" to link process partners within international value chains from the forest to the customer - Wood Value Chain (WVC). Using ICT-supported standardized descriptions and classifications of business profiles, services, raw-materials and products as well as knowledge-based, computer-aided methods and algorithms, the platform will foster an improved partner communication and the exchange of contrastable information. To optimize the supply of relevant data gained outside, cutting-edge services, realized as mobile phone applications, will be connected to the platform. WoodApps overarching objective is to strengthen the sustainability and competitiveness of the European forest-based sector as well as to promote the utilisation of cutting edge knowledge in new applications. Therefore WoodApps strengthen the link between the forestry and the rapid growing, cutting-edge ICT sector. © Copyright 2011 Scheller Systemtechnik GmbH – All rights reserved.